(HARLINGEN) – More than 50 employers from across the state gathered at Texas State Technical College’s Cultural Arts Center for the Fall 2018 Industry Job Fair, ready to hire TSTC students and graduates for good-paying, in-demand positions. More than 500 TSTC students and alumni were dressed to impress at the fair, many with resumes in hand, applying for positions and completing on-site interviews. 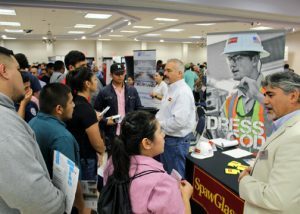 Espinosa said the main objective during Industry Job Fair is to connect students and employers. Carlos Gomez, a regional human resources manager with Martin Sprocket & Gear, said they have seen a lot of success from hiring graduates of TSTC’s Precision Machining Technology program. Gomez also said partnering with technical colleges like TSTC helps them fill a shortage in their workforce, especially with an increased number of similar companies opening and competing for skilled workers. Many of the other prospective employers at the event shared the same sentiment. Samuel Saldana, building services manager for SpawGlass Contractors, said many of the TSTC graduates they have hired have performed above expectations. Saldana added that the longtime partnership between SpawGlass and TSTC has been very successful and helpful. TSTC’s Talent Management and Career Services office connects students and employers statewide by hosting employee spotlights, interview practicums and industry job fairs. It also assists TSTC students and alumni with resume writing, interview preparation, career research, job searches and networking. For more information about TSTC’s Talent Management and Career Services office, visit tstc.edu/student_life/careerservices or call 956-364-4940. This entry was posted in Harlingen on October 29, 2018 by Amanda Sotelo Sotelo.